This is the trade paperback collecting together the seven-issue comic of the same name. It tells the story of the suggestively named Barbara Thorson, an early-teens geek girl who has a flair for mythology and Dungeons & Dragons, a bit of a problem with aggression, and a very active imagination. She has troubles with bullies at school, but the persistent concern that hangs over the majority of the story with an almost Lovecraftian sense of gloom and foreboding is that Barbara’s mother is dying of cancer. Barbara, with the help of her mystical weapon Covaleski — named after a baseball player who was nicknamed the “Giant-Killer” — sees herself as the protector of her world, destined to battle the giants when they arrive, in order to be able to defeat even death. The illustration style is European, but clearly has influences from Japanese manga. At a few points in the early chapters, I was somewhat confused as to what was going on (and I remain confused about the exact nature of a few of the character’s relationships to one another), but persisting with the story and seeing it through to its end certainly pays off and cleared things up considerably. I find myself somewhat at odds with the underlying thrust of the narrative, however. On the one hand, we have an emotionally traumatized young girl working through the difficulties in her life through complex, almost messianic, fantasies, in which those fantasies sometimes come crashing into a wall of reality, but in other cases they see her through to a more mature and ultimately triumphant position in her life despite her own personal family tragedies. On the other hand, because fantasy and reality clash with one another, but sometimes augment one another considerably, there is an uneasy tension in the entirety that left me somewhat ambivalent. A school counselor tries to reach out to Barbara, and eventually becomes friends with her; and yet the urge to psychologize trauma and to paint fantasy as in some sense unhealthy escapism and avoidance of reality is not the message that I think the authors intended, and doesn’t resolve the plot as it is written. If nothing else, it almost seems as if fully entering into the fantasy for Barbara and some of her friends is, in fact, what allows her to fully face her fears about her mother’s impending death, and ultimately to overcome them. 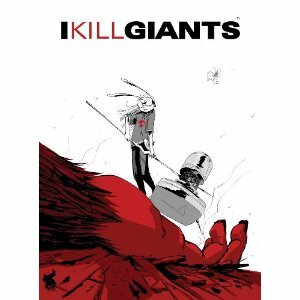 I Kill Giants is a somewhat difficult, unease-instilling, and challenging story, but one that is very worthwhile in the end, and rewarding to pursue through to its conclusion. More heroic but imperfect female protagonists of Barbara’s type would make a great many modern stories, or re-castings of ancient ones, far richer. As a kind of paean to the importance of fully living one’s myths in order to fully live one’s life, I Kill Giants is a brief but brilliant masterpiece.